Planning and writing competitive proposals require various disciplines. These include training in and understanding Federal Acquisition Regulations and contract clauses which dictate ultimate contract performance. Other disciplines include the ability to accurately interpret Government solicitations, perform technical research, estimate the costs of labor and materials, and develop effective graphics and narratives which clearly convey solutions. Capture Managers: gather information on customer requirements, wants, and desires. 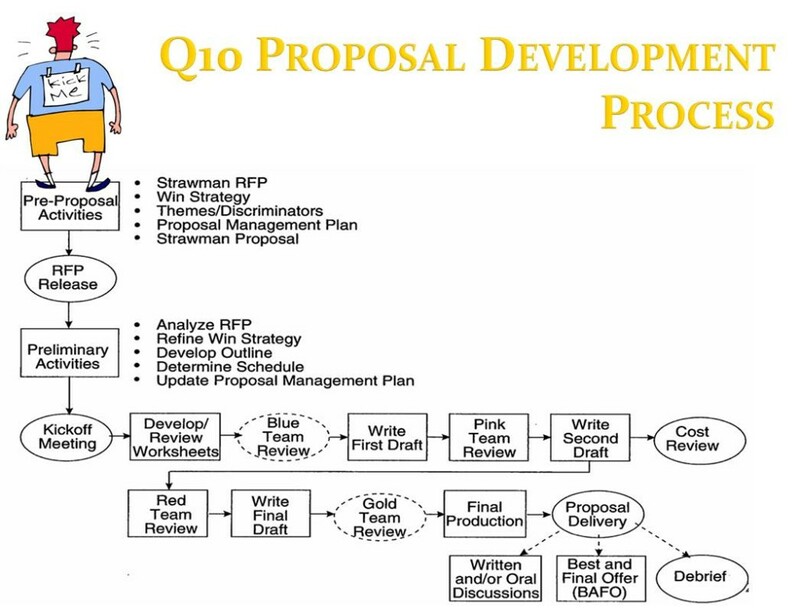 Proposal Strategists: spearhead development of proposal win strategies. Proposal Managers: manage all aspects of proposal development, guiding writers and reviewers. Proposal Coordinators: administer proposal development, production and delivery. Subject Matter Experts, Researchers, and Analysts: gather and relay information relevant to the bid. Writers: craft responses to proposal requirements. Editors: improve the accuracy and consistency of both text and graphics. Review Leaders: organize evaluators to assess and score the proposal during its evolution. For every type of customer, type of contract, and type of bid, Q10 Contracting personnel learn and convey the customer’s acquisition procedures, source of funding, type of money, and evaluation processes. Regardless of proposal type, Q10 ensures every proposal we support is fully compliant to the solicitation requirements, is clearly and concisely written, is responsive to “bid drivers,” and reflects professionalism our clients will be proud of.